Mercure Hotel Chateau Berlin am Kurfuerstendamm. Wifi! Experience the vibrant and flourishing Kurfürstendamm: At the 4-star Mercure Hotel Chateau Berlin on the Kurfürstendamm you will be a short walk from the famous boulevard. You will love the relaxed atmosphere of our hotel. All 72 rooms are air-conditioned and have sound-proofed windows and free WIFI. If arriving by train, travel to the main train station, located 3.1 miles away. Tegel and Schönefeld airports are 9.3 miles and 18.6 miles away respectively. By car, take the A100 highway. Berlin's City West quarter is steeped in history: For over 100 years the area around Zoo train station, Tauentzienstrasse and Kurfürstendamm has been at the beating heart of Berlin. Spectacular projects showcase City West's recent renaissance. At the 4-star Mercure Hotel Chateau Berlin you can choose between a Standard or Superior Room with a double bed, or a luxuriously furnished Privilege Room with a double bed and sofa. We provide an iron and ironing board in every room Iron with ironing board. All 72 rooms are air-conditioned and come with free Wi-Fi. One child aged up to 12 can stay in their parents' room free of charge. Your pet is also welcome (for a charge of EUR 8 per night). The rooms and especially bathrooms are in a very bad condition. When I usually need 2 minutes to dry my hair, with the blowdryer in my room I needed 15 minutes. There was black mold in the shower and even though I am a platinum member, I neither received an upgrade, nor was my room located on higher floor as in my preferences requested. Also I prefer one bed (queen or king) but was provided only with two single beds next to each other. It was very uncomfortable to sleep. At check-out, the employee was not interested in my comments / complaints and did not offer me any compensation or discount. There was a great hospitality and helpfull reception. Stuff was ok. Great and clean room. Very bad wifi in the room. furniture are beat up and not functional. Room decoration and bathroom were completly obsolete. WIFI was not working (to far from wifi source). There was a terrible smell in the hotel, specially at the restaurant level. No meeting room. Staff was somehow useful. I would not recommend. We are truly sorry to hear about your unpleasant experience as we target to meet the highest customer satisfaction standards. Therefore we frankly thank you for your feedback and your observations as a basis for us to continuous improvement. Once again, we thank you for staying with us and we would be very happy about welcoming you again, giving us another opportunity to serve you better. It's an average hotel with a great location. I expected more from a Mercure hotel though, it was more like an older Ibis. I booked a room with a double bed but got one with two twin beds pushed together, so it was disappointing and uncomfortable for us. Thank you very much for your feedback - we are sorry not to have met all of your expectations. We would be very happy if we could welcome you again, giving us a second chance to serve you better next time. Beware, the wall between two rooms are so thin. My neighbors return to the hotel around 12:00 midnight and decided to have a bath, the running water from the bathroom can be heard throughout. The room door slammed very loudly. We are truly sorry to hear about your unpleasant experience as we target to meet the highest customer satisfaction standards. We would be very happy about welcoming you again, giving us another opportunity to serve you better next time. The hotel provided exactly what we needed--a good price , in a good location, a GREAT breakfast to start each day. Staff were helpful. When I needed to make a phone call to a tour agency,in German (which I don't speak), they called for me. Close to shops and restaurants. Room was a good size but hot, AC was not strong enough to cool room at all. When my wife asked the front desk about wi fi issues, weak and constantly requiring you to sign in, she was told rudely that that is the way it is. Talked to the front desk about issues at checkout, staff just shrugged...I guess that this is the way it is, at this hotel. We are truly sorry to hear about your unpleasant experience as we target to meet the highest customer satisfaction standards. Therefore we frankly thank you for your feedback and your observations as a basis for us to continuous improvement. Great location, nice staff but...that's about it! The worst 4star hotel ever stayed in EU. The room insulation is abesent.. You can hear all neighboors whatever they say. The rooms were cold. The room service left all day the window open during end Dec 2017 with zero-sub zero ambient temperature!!!!!! The room temperature could not be restored even with full heating by central air conditioning. Reception said that they did not have any electric radiators to assist us. We left immediately for other hotel!! We arrived after midnight and had a friendly and helpful reception. The room is very spacious, but needs some serious refurbishment. The carpet was not clean, the sofa had a huge burn mark and the windows neither insulate nor keep the noise at an acceptable level, made worse by two fanlights that could not be shut and despite reporting to desk, were not fixed. The bathroom was very small, but very clean, thank you. Overall disappointing, and not really value for money. The location is perfekt, staff very nice and the rooms has a charm. The breakfast was very good. I did not like that we had two singlebeds put together not a real dubblebed. Internet was not very good. Hotel is showing its age, but clean and well-kept. Location is very good, just off Ku-Damm, the main shopping street and several blocks from a S-Bahn station. The 109 bus from the airport dropped me off nearby. Light blocking curtain/blind would be good addition to the room as it got really bright and hot in the room. A good value and good stay overall. I hope we where unlucky, the hot water pump was broken saturday and the elevator was out order sunday. Result : we had to carry our bagage from 4th floor. When i talked to the receptionist, she was more aware of the poor/misssing communication with her colleague that had not inform her about the problems. No excuses or help from her.. my feeling was : get out of here. Internet also close to not existing. 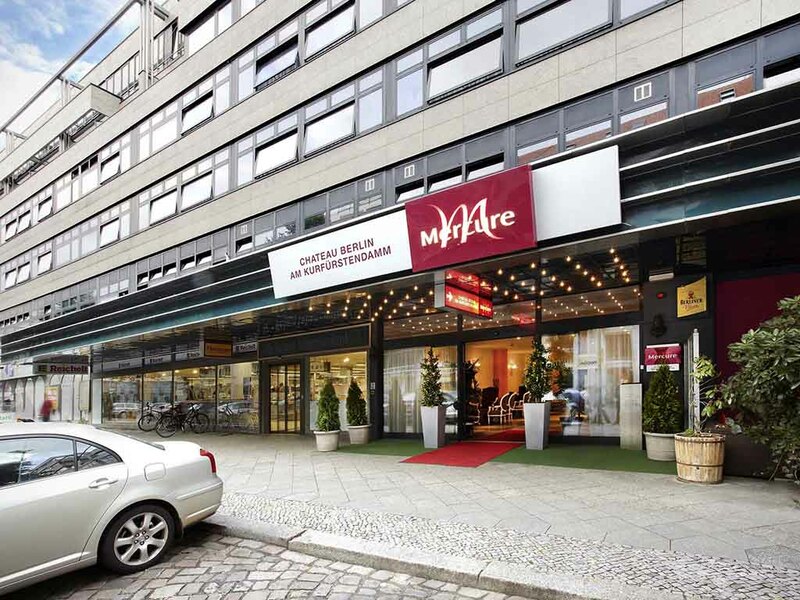 I chose this hotel because of its location and for ease of getting to Tegel airport. I believe it's a franchise hotel and has only recently come into the Accor family. The girls on reception were really helpful but sadly not as professional as in other hotels. It's very clean but old fashioned. The bar is in the reception area and there is a limited range of drinks on offer. The only food available seems to be breakfast. The breakfast was up to the usual Mercure standards. To be clear we are and will remain positive about the Accor Hotel Group and its hotels. We recently visited Berlin and normally stay at the quite excellent Novotel on Fischerinsel. Sadly it was booked out so we booked four nights at The Mercure Hotel Chateau on the other side of town. I don't want to bang on about it but in summary: Location is great for shopping, restaurants and a nearby U Bahn and S Bahn. Hotel itself is shabby and our room had stained walls and curtains and the odd hole in the carpet. Survivable if there was nothing else. However sleep is hard to come by with a combination of an Egyptian Discotheque under the hotel and air conditioning plant outside the the room on a terrace which cycles on or off all night in 15 minute intervals. Room 404. At least on Sunday the Disco was closed. The reaction of the night staff was sympathetic. We struggled through and on check out were met with the most demotivated and demotivating lady I have ever met working in this chain. I was insultingly informed that noise is a subjective issue and not everyone hears it the same. Really ! I never would have guessed . I am sure there are some rooms that are fine. But the point is that a thumping bass unit 2.45 am on Saturdays, combined with faulty equipment is not subjective. Anyway never again here, but look forward to the Novotel. I do not think this Hotel managed as it is belongs in the Accor Group. We spent five nights at the Chateau Hotel. Staff are very friendly and multi-lingual. For a city like Berlin with many centers, the hotel is not right at the center but at the Ku'damm Street, which was the center of "West Berlin" once. The airport Tegel is only one bus away. The starting point of the tour buses and the famous KaDeWe shopping center is quite close. There are many restaurants around and a very supermarket just across the street. The hotel is a bit old but the price is accordingly decent. Nice hotel, good location and great staff. I stayed here for 1 night while on business in Berlin. This hotel was chosen as it's walking distance from my customer. The hotel staff were friendly and helpful. The room was clean and a good size. Location was good with a number of restaurants within walking distance and a 24hr sports bar just next door. Breakfast was nice with a good selection. I would stay here again if in the area.